These days, people aren’t looking for the generic restaurant experience. When they dine out, they look for something unique that will keep them coming back to the establishment. But from the endless number of fried chicken joints to the growing population of gastropubs that serve mason jar cocktails, it seems like restaurateurs are running out of new and interesting concepts to delight the public with. Though once in a blue moon, someone envisions an idea that has never been explored before. It might strike some as odd, outrageous even, but without a doubt it’s genius. 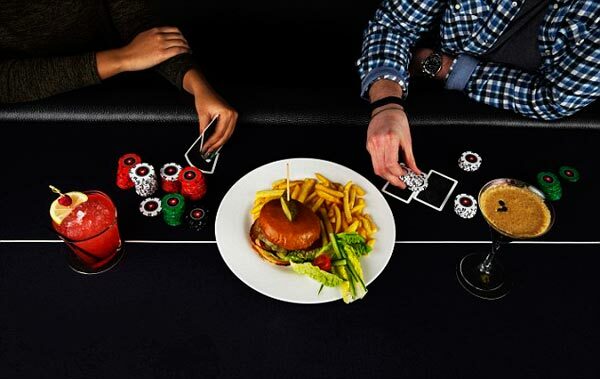 Among these distinct and quirky restaurant concepts is a pop-up restaurant where diners can score a free meal if they manage to maintain their 10,000 worth of chips at the end of their pre-poker dinner. Ever heard of “Pay-By-Poker?” You probably haven’t, until now. To kick off the UK and Ireland Poker Tour, All-In Kitchen hosted a pop-up poker restaurant from January 19 to 21 in East London, where patrons were handed 10,000 chips at the door at no cost. After three hands of poker before the meal, diners had to have a remaining balance of over 5,000 to only pay £5 for the meal. If they ended with at least 10,000, dinner was on the house. Meals at All-In Kitchen normally cost approximately £50. Though it is possible to have 10,000 or more remaining after the third hand, poker isn’t an easy game to play. Betfair explains that the popular casino game is always evolving and that you must keep up with the latest poker strategies to constantly stay one step ahead. Despite the complications of poker strategies, diners truly enjoyed the experience. They got to dabble in a bit of gambling and even munched on savory poker-themed meals, such as the Royal Flush of King Crab Thermidor and the Four-of-a-Kind Lamp Chops. Because of the success of the first dinner, UKIPT sponsors have planned to offer the “Pay-By-Poker” experience at several pit stops of the tournament. Whether you’re a serious gambler or just play poker for kicks, do your best to stop by if you happen to be in town for their pop-up events.